From the first word to the last of the Hebrew Scriptures, Messiah left His mark even before He stepped onto this earth. Do not suppose that I came to dismiss the Instruction or the Prophets! I have not come that I should dismiss, but instead, that I should fulfill! With His own words He establishes the basis for the later statement from Rabbi Chiyya (made sometime in early 3rd century CE) that is recorded in the Talmud. He is the fulfillment. Every word, every action, served as a culmination of all that had been written by the prophets. Whether man can understand the way it is fulfilled or not, the truth still remains that He has come to make good on all the Words. Thus, in looking at the accounts from the ministry and life of Messiah during His first coming with this perspective in mind, the reader can hopefully be guided by the Spirit to new appreciations of the Messiah, whose life was infused to the core with meaning. Everything was done on purpose. There was not a moment that did not brim with merit and value in His life. And they had gone twenty-five or thirty stadia, and they saw Yeshua while He was walking upon the sea! And when He drew close unto their ship, they feared. Obviously, there is reason for their surprise and fear. Never in recorded Holy Writ had a human being walked upon the surface of water! This was an unprecedented miracle in the history of men! Yeshua had so seemingly nonchalantly performed an act that could not be quantified in the religious life of His students. Turning water into wine was a miracle for certain, but that could be grasped because Moses had similarly turned water into blood. The miracle that they had just previously experienced of the feeding of the five-thousand was impressive, but also had precedent with the giving of the manna for forty years, and the miracle of Elijah sustaining the widow of Zarephath with oil and flour. There was no miracle that they could look to in order to say, “Oh, this makes perfect sense; we know all about this kind of stuff!” They had nothing. Nothing, that is, except two places in Scripture that hinted that this very thing would happen! And the waters were mighty, and they increased much upon the earth; and the ark walked upon the face of the waters. Do you see the link laid forth from the literal Hebrew? While most translations render something like “went” or “moved” instead of “walked,” the literal Hebrew is HEYLEK, and truly means “walk.” In symbol, right in front of our eyes, a vessel by which mankind could be saved from destruction, is said to have walked on water! The actions of the Messiah on the Sea of Galilee parallel precisely the prophetic symbolism recorded by the prophet Moses from ancient times! Messiah is the ark that walked on water! He fulfilled what was spoken in a powerful way, proving that all who would be found “in Him” would survive to enter the new world and the Kingdom of the heavens on this earth. Who stretches out the heavens by Himself, and who walks upon the waves of the sea. In this brief statement, Job professes a prophetic reality that had not yet happened on the earth, and yet was as good as done, in his eyes. 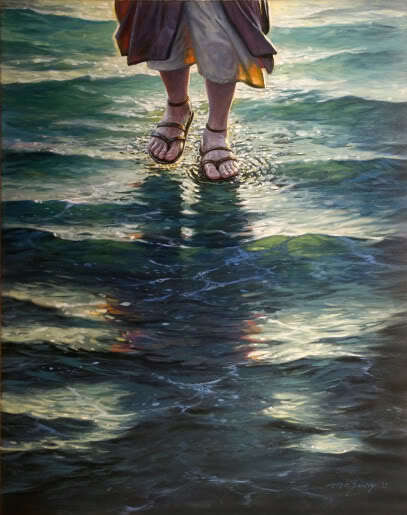 Elohim, the Holy One Himself, would walk on the waves of the sea. It took many long generations after this statement to finally be realized in the person of Yeshua: the Word made flesh, the Emmanu’El – Elohim with us. He fulfilled a prophecy that was so obscure that His own students had no idea it was awaiting to be fulfilled in the first place, and feared at the moment the miracle occurred in their presence. They could not understand the fulfillment of words written so long ago now being performed before their eyes in Yeshua’s walking on the water. This is just a glimpse of the power and purpose of the Messiah; He stands undaunted, fulfilling every last single letter of the Word of Most High. Nothing shall be left wanting. No prophecy shall go unfulfilled. In the end, Messiah will be seen truly as the Author and the Finisher of our faith. Everything we have rightly believed will be fulfilled in Him.